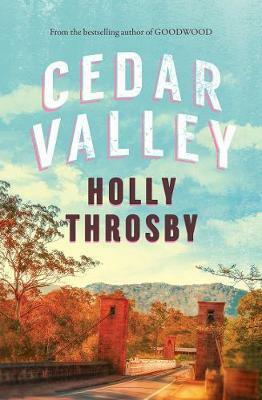 Cedar Valley, Holly Throsby’s second novel, exists in the same world as her first novel, Goodwood. It’s an area a couple of hours south of Sydney, near the coast, near a large regional town, and very firmly situated in the early 1990s. Cedar Valley is a small town, seemingly much beloved by its inhabitants and oft visited by weekend tourists who come to enjoy antiquing and fantastic country pies. On this summer day, two new inhabitants arrive: Benny, a young woman who has just finished uni and is looking for sanctuary; and an unknown but extremely well-dressed man who sits down on the footpath and dies while people go about their afternoon. In Cedar Valley Holly Throsby has crafted a quiet mystery which brims with the energy of its characters’ inner lives. Benny wants to know the mother she never knew. The local detective sergeant wants to solve the mystery of the unknown dead man more out of a need for activity and control than any sense of law and order. Cora, outside whose antique shop the man died, feels the stirrings of existential fear for the first time. What is wonderful about Cedar Valley is the sense of a complete community. Throsby keeps a skilful pace, checking in with the towns inhabitants, both old and new. She moves you along so well at the pace of the people of Cedar Valley that you do not realise straightaway the ways in which she is subverting the expectations of the small-town mystery. Unlike the quiet small town with a mysterious death and a new arrival in which the visiting investigator solves the mystery, Cedar Valley, and before it Goodwood, solve their mysteries internally. All that you will learn in Cedar Valley you will learn from the inhabitants of Cedar Valley, old and new. And that is a very satisfying journey. Marie Matteson is a book buyer at Readings Carlton.